Ignore what the calendar says – it’s officially summer over here. The temperature has been rising, my favorite sundresses and white denim pieces have made their way out of the closet, and we had our first after-dinner walk to the ice cream shop. I also spent more time than I’d like to admit researching kiddie pools today (I can’t decide: the watermelon or the donut pool? Tough choices!). I’m sharing a few of our recent and upcoming summer adventures below, as well as a few more links and updates in this week’s download: Weekend Adventures. Perhaps the biggest sign that summer is here – a packed calendar full of warm weather activities, family parties, barbeques, and weekend travel adventures. I’ve already had a few fun-filled weeks as a result. I took an awesome class at Winston Flowers on herb gardening, and planted my own mini garden full of fresh herbs. It’s sitting on my office windowsill, and thanks to what I learned in the class, I’ve actually kept it alive and keep clipping pieces to use in my recipes and cocktails. Maybe a vegetable garden is next?! Over the holiday weekend we hit up several barbeques, pulled all of our patio furniture out of storage and cleaned up the yard, and took Jane to the zoo for the first time! It was actually my first time at the Franklin Park Zoo too, and we had a blast. Jane loved the monkeys, the playgrounds, walking right up to the kids zoo area where should see prairie dogs and pet goats; and we got tickets to see their new Destination Dino exhibit — a fun thing to do with dinosaur-obsessed kids! Summer Reading. I am halfway through my reading goal for the year (12 of 24 books!) thanks to finishing up a stellar collection of hilarious essays by one of my favorite authors: Look Alive Out Thereby Sloane Crosley. A little bit of rainy weather, a few long car rides, and an impending due date from the library (seriously, the best reading motivation!) had me jumping right into the next book. I’m loving the book Women in Sunlightby Frances Mayes (the author of Under the Tuscan Sun). It has me itching for a trip to Italy! After I finish that book, I feel like I might jump out of my comfort zone and attempt to read Milk and Honeyby Rupi Kaur. I’ve never tried to read poetry, and feel like this might be a good start! Beach Days. I think it may finally be warm enough to start heading to the beach! We are so lucky to live close to the ocean, and I’m making it my mission to spend more time there this year (last year was a challenge with an infant!). My in-laws gave Jane some really awesome beach toys that are a must for our beach tote. And after years of hunting for a bathing suit that doesn’t make me want to cry, I think I finally found “the one” (it’s on sale this week if you’re hunting for a flattering swimsuit!). Summer Entertaining. The blog has been a non-stop, al fresco dining, warm-weather party the past two weeks! I shared a colorful fiesta with grilled chicken tacos and frozen peach margaritas, talked about some of my favorite picnic packing tricks, and rounded up tons of summer BBQ recipes from the archives! 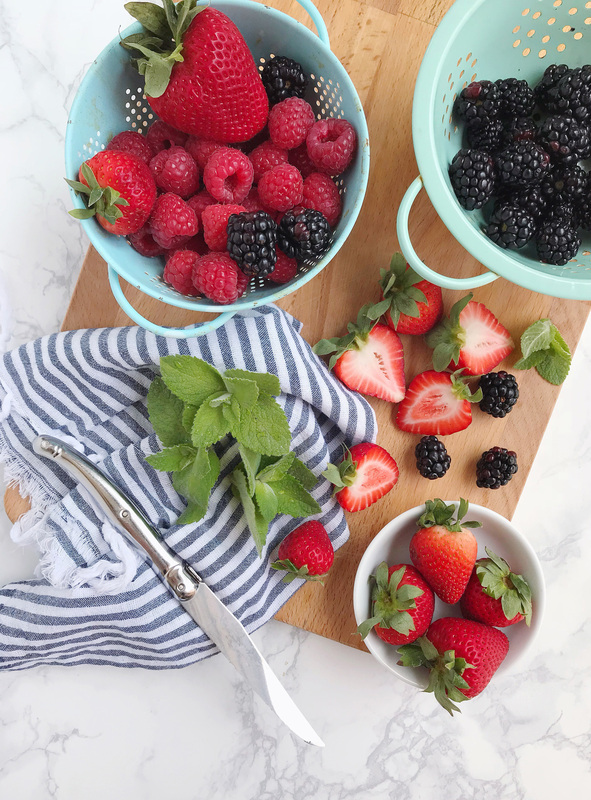 Plus there was a bright and cheery summer garden party tablescape full of affordable pieces from Target, and a new recipe for a 15-minute, no bake summer dessert! Thyme Limoncello Hostess Gifts. Raspberry Mint Spiked Lemonades.